Come as you are. No church experience is required! people who want to become more like Jesus. Plan to show up about 20-30 minutes before the gathering starts. This will give you plenty of time to find a guest parking space, check-in your kids and locate a restroom. Stop by the coffee shop for a hot or cold beverage. *If you let a parking attendant, greeter, guest kiosk volunteer or usher know it is your first time visiting True Grace, they will welcome you and give you a card for a free beverage at the coffee shop. Bringing kids and young people with you? The babies and toddlers spaces are located on the upper level of our campus, directly across from the elevator. A separate space for nursing moms is also available. Preschool – 5th grade kids spaces are located on the lower level of our campus, directly across from the Youth Center. Check-in your kids at one of our computerized stations. 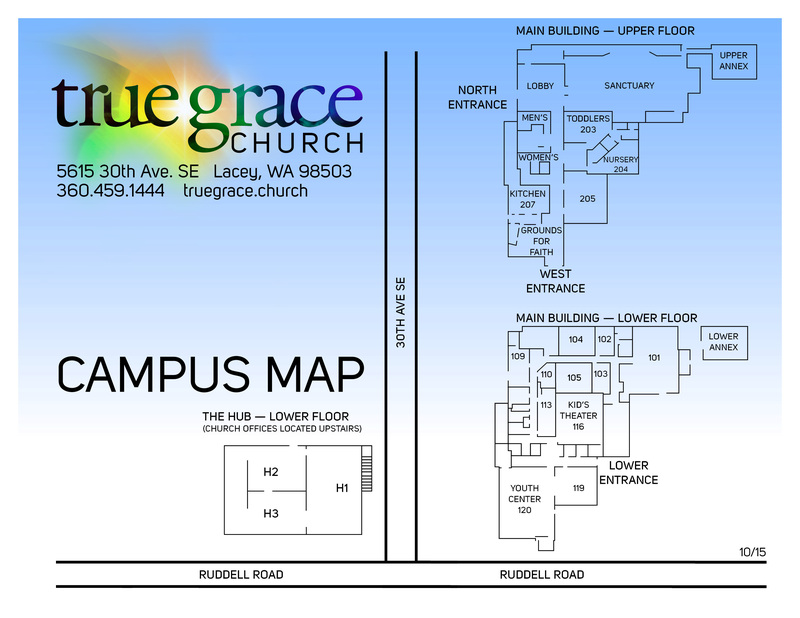 If you are new, our friendly True Grace Kids host team will be happy to guide you through the safe and secure process. To speed up the check-in process, please fill out our online family registration HERE. We utilize a numbered security system. When you check-in your kids, you get a number and your kids will get a matching one. Hang onto that printed slip, you’ll need it to pick up your kids after the gathering. Toddlers through 5th grade will learn age-appropriate Bible-based truths, interact with others and engage in lively worship with caring leaders. True Grace Kids is a safe place. Every volunteer and leader has gone through an extensive background check and have been trained for emergencies. To learn more about or to keep informed about upcoming events you can connect with Pastor Lauren or join the True Grace Kids Facebook page. True Grace Youth offers Life Groups for grades 6 through 12 that are age and gender segregated during the 11:15 AM gathering every Sunday. You can also check out their Facebook or Instagram to stay up to date with all the latest info.